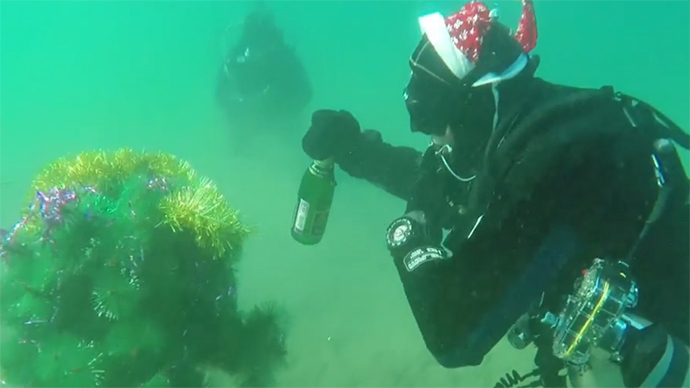 A group of divers in Russia's Far East decided to be the first to celebrate the coming of 2015 – by drinking champagne and swimming in circles around a New Year tree at the bottom of a nearly frozen bay. “The feeling is amazing, visibility is good, water temperature is about -1C. 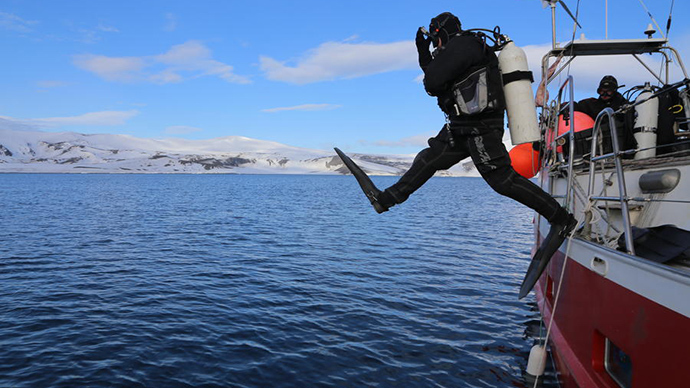 I think that in a day or so [the bay] will freeze over completely,” one of the divers told RT’s Ruptly agency. The divers entered the nearly frozen Shchitovaya Bay in the Ussuriysky Gulf on foot on Saturday, breaking through the mushy ice. The group placed a decorated fir tree at the bottom of the bay. Once completely underwater, they opened a bottle of champagne and shared a drink together. Then all of them joined hands and circled around the tree. Ruptly’s video shows the whole event, which the group apparently enjoyed. The extreme divers hail from Russia’s far eastern city of Vladivostok, which will be one of the first regions to celebrate the New Year in the country with 11 timezones. The New Year holiday is extremely popular with Russians. Many also celebrate Orthodox Christmas on January 7. Nowadays, an increasing number of people also join the celebration of what is often referred to as Catholic Christmas on December 25. Meanwhile, a fir tree is often decorated in homes well before the coming of the New Year and stands until at least the so-called Old New Year on January 14.